Behavioral-Based National Freight Demand Model | Resource Systems Group, Inc.
RSG is developing an innovative national-level freight-demand modeling tool to improve current methods for evaluating national freight policy alternatives and their impacts. 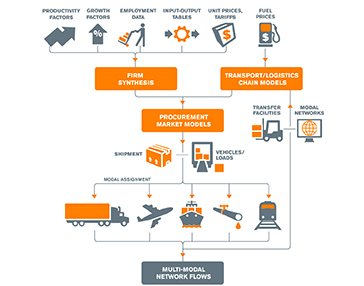 The tool RSG has proposed will include several cutting-edge components, including a procurement market game (PMG), which will apply aspects of game theory to the evolution of freight supply relationships. The tool will also incorporate a carrier selection model, which will be based on empirical research conducted by RSG’s teaming partner, the University of Washington. In addition, RSG will be developing software to implement the national freight demand modeling system—permitting the creation of a fully-integrated modeling tool. The freight modeling tool will provide FHWA with a powerful means to evaluate national policies affecting goods movement. It will also provide a valuable resource for state and regional planning agencies looking for guidance to improve their own freight demand forecasting tools.